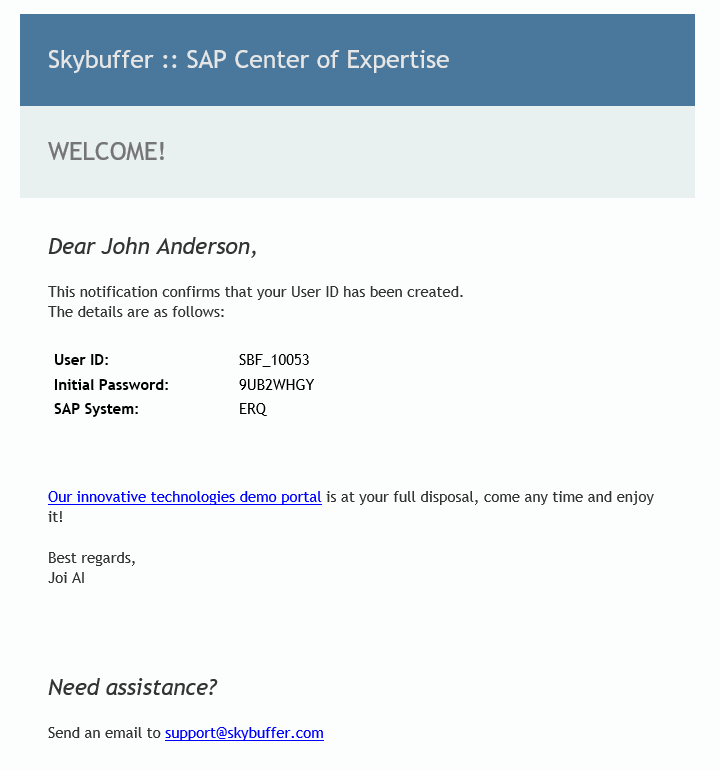 Have you created SAP user? Login to the Portal! Below you will get step-by-step guided on how, where and what for to use our SAP certified solution integrating online Conversational AI and offline email-based product and SAP Qualified solution of Travel Expenses and Reporting showing the upgraded Fiori capabilities. Intelligent Decision Dimensions solution integrates easily and deeply into Customer’s SAP EcoSystem (highlighted in blue here). The solution is installable into SAP On Premise system as an add-on and plugged into SAP Cloud Foundry via SAP Cloud Connector using OData protocol. All you need is to simply start chatting and/or talking to your SAP S/4HANA or Business Suite! To appreciate all the benefits an authorized SAP user has and all the values our solutions can offer, you need to have an SAP USER ID. Have it created by our chatbot Joi! All you have to do is to give your name and email address. Don’t log into the system, use the chat and in no time enjoy your access to SAP data. There are hundreds of scenarios in dozens of SAP domains where our AI-rich chatbot proves savvy, useful and even indispensable. Moreover, she is multilingual and can assist Intelligent Enterprise workers speaking English, German, French and Spanish. Once your SAP ID is created by our chatbot in the system, you get a respective notification to the email you have provided. The message will be in the language of communication you used with the chatbot. It will contain the temporary password which you can later on change, of course. 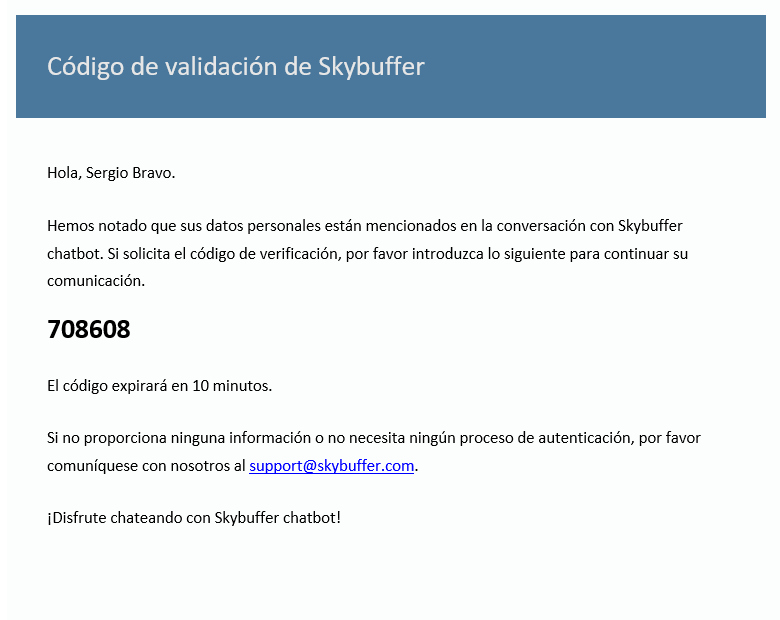 Every time you talk to our chatbot via unknown user channel, you undergo the procedure of user authentication. 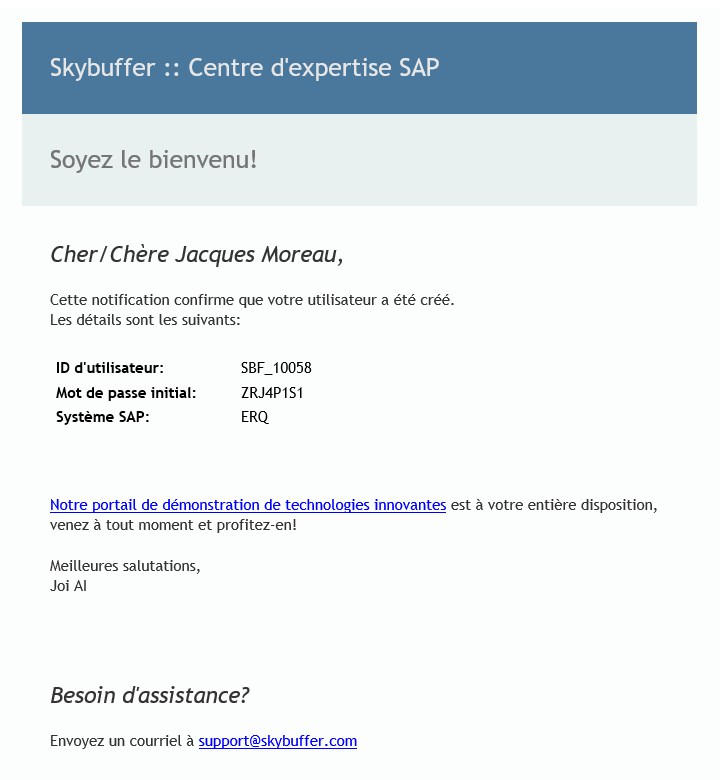 And this is exactly the case where you can see the integration with Action Cards, the other part of Skybuffer SAP certified add-on. The User ID validation is carried out by the code which is sent in the notification email to the address saved in the system. Another option is to choose receiving this code via sms. Ask our chatbot to create, for example, a leave request for you and go through the process of SAP User Validation. 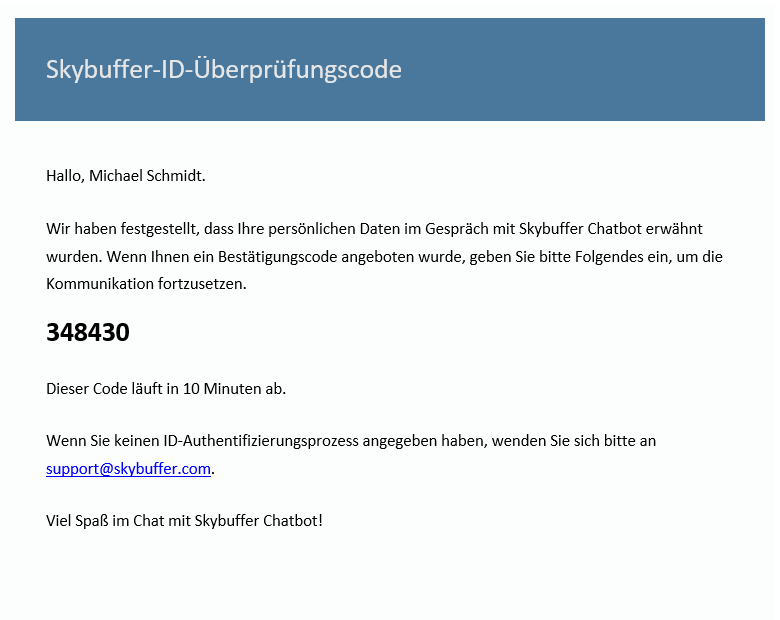 If you can’t access the SAP system because your user ID has been accidentally (or on purpose) locked, you can ask the chatbot to unlock it. So she will do, just in the blink of an eye! 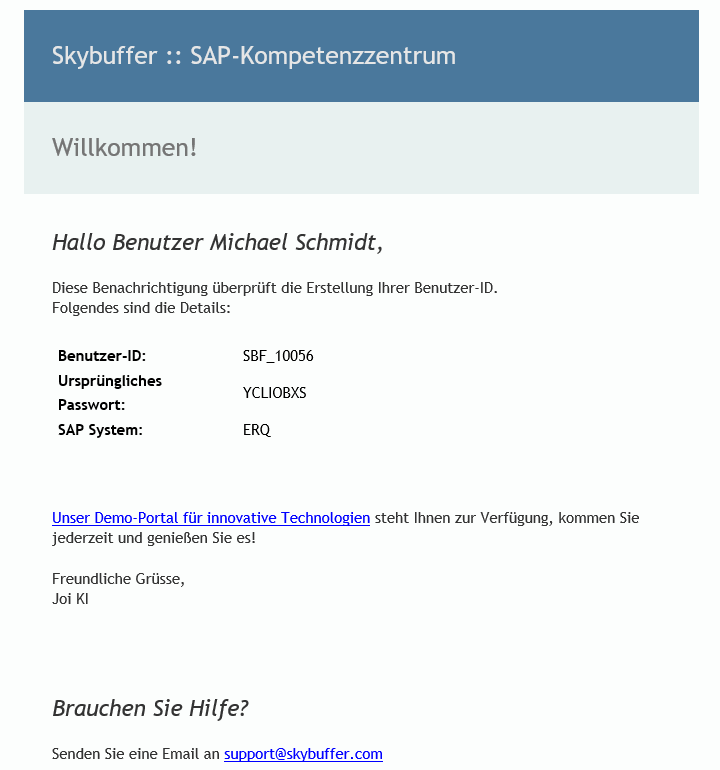 All you have to do is to prove that you are a real SAP user. 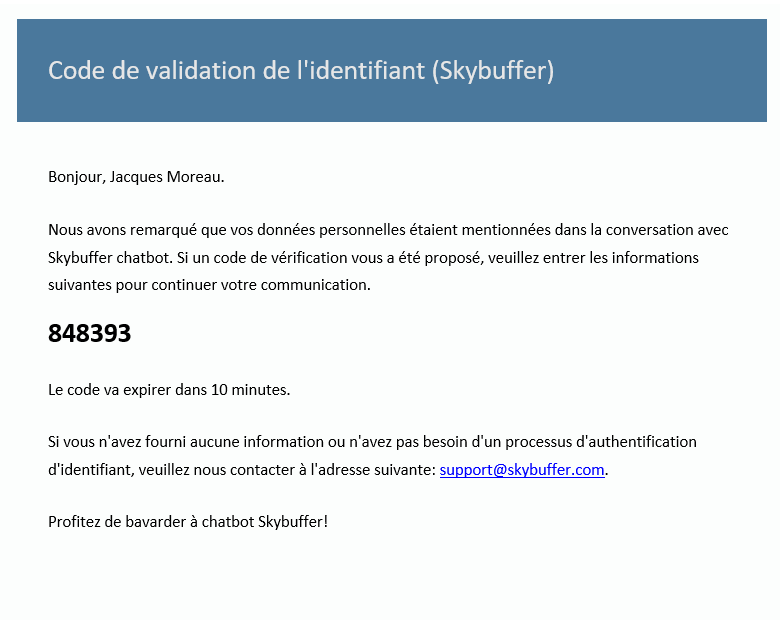 The chatbot will ask you for your ID and will send a verification code to the email (or text it to the mobile phone) indicated in your SAP profile. After you add the code and are proved a valid user, your ID gets unlocked. By analogy with the case of unlocking User ID which can happen to anyone who enters wrong password a few times, the issue of resetting the password can be easily solved by the chatbot on demand. 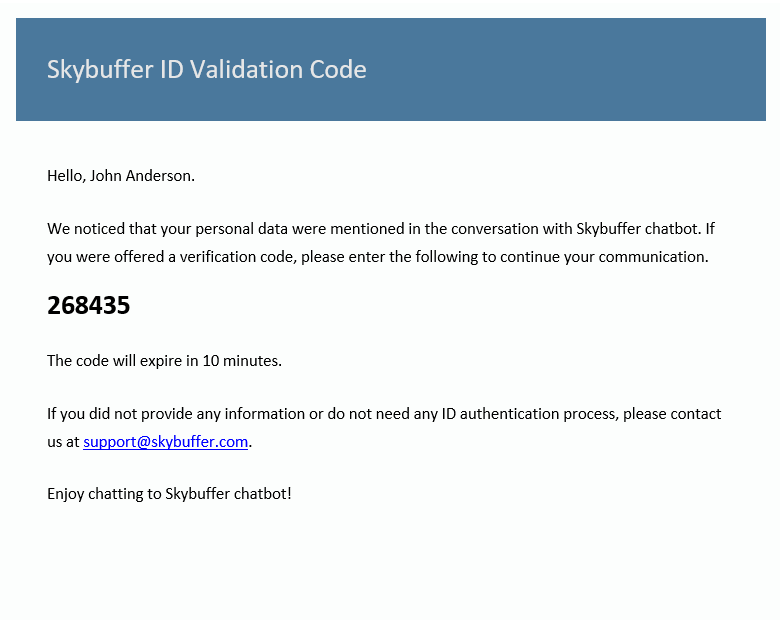 Likewise, the chat bot will instantly carry out authentication and send the locked user a verification code to SAP authorized email. What is important here, the bot will always check the user’s validity period even with the successfully completed ID check to prevent attempts of getting unauthorized access to the SAP system. The same procedure applies to the scenario of unlocking the User ID. From any edge you can communicate your desire or urgent necessity to create a leave request. 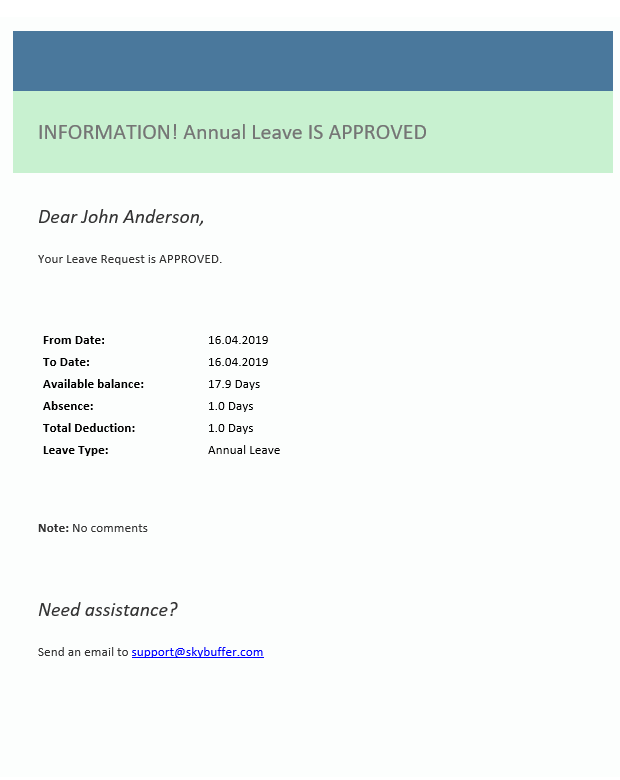 The chatbot will first check the absence quotas you are entitled to, will ask you for the type of leave requested, for the necessary dates, for any possible comments to the document and, if everything is OK, will create the appropriate leave request in SAP. Later on you can check it in your Fiori application. Once you have your leave request created in the system, it goes for approval. For the demo purposes you will be assigned the role of the responsible approver of your own leave request. So you will get an email with all the details of the created leave document and active buttons asking you to take a decision, i.e. approve or reject the request. 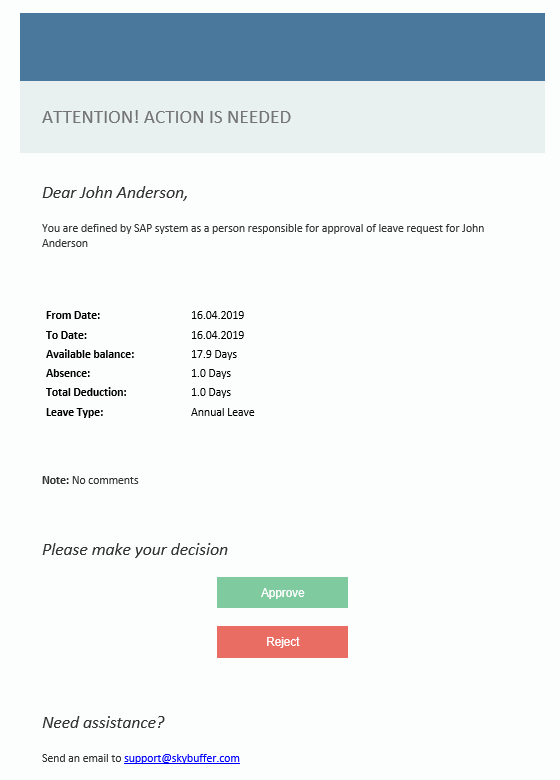 As soon as you click the necessary button, the decision gets saved in SAP and you get the email with the decision taken on your request. All is done asynchronously, at any convenient time, from any edge. Take your decisions without logging into the system. Enjoy the asynchronous access to SAP. 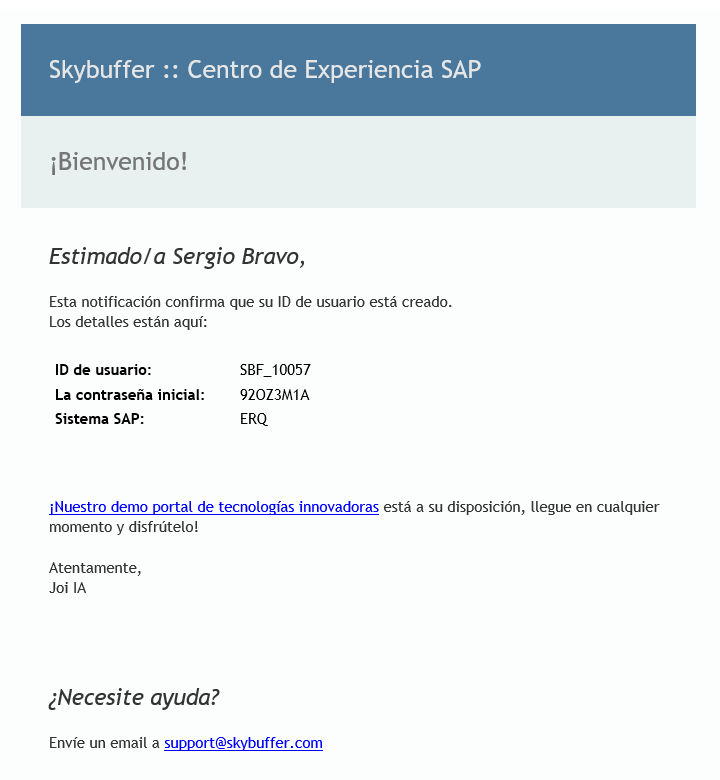 Find out now how to compose business reports using Skybuffer extended application of Fiori which analyzes business trips KPIs in SAP environment. SAP Qualified PPS controls travel expenses per business unit, mileage covered per trip, CO2 emission per vehicle type/employee/subsidiary, etc. Upgraded SAP Fiori interface allows mobile data inputting. Google Cloud Platform integration collects credible data for ecological management system audit and contributes to the company’ sustainability. If the user needs to know particular parameters of their travel expense reports, they may ask supplier’s virtual assistant for them instead of logging into the SAP system. There are no rules on how to ask for such information, the enquiries may or may not contain necessary details. Still, our Conversational AI-rich chat bot will understand both general requests and detailed ones and will make sure that the data like trip/travel expense number, employee personnel number, etc. are provided and valid. Only then she will give out the requested information. The chatbot will provide the user with the following details: period, destination, trip approval status, financial status, reimbursed amount.